Back in the ’80s, Rune Kristoffersen was a founding member of the Norwegian post-punk/new wave band Fra Lippo Lippi. The band was somewhat popular in Europe (and, mysteriously, the Philippines). But by the ’90s, life as a musician had lost its charm. After a few years as ECM’s label manager in Norway, Kristoffersen decided to strike out on his own, and Rune Grammofon was born. 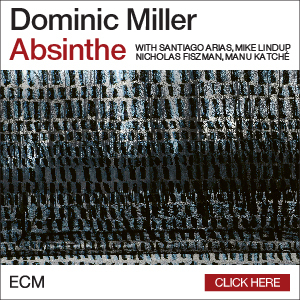 “I wanted to have my own label, basically, because working with ECM, I was doing the work after the product was finished, promotion and marketing, but I wanted to be part of the whole process,” he said. On Nov. 30 and Dec. 1, Rune Grammofon celebrated 20 years of existence with a two-night concert at Oslo’s Nasjonal Jazzscene, a beautiful and intimate space with a phenomenal sound system. The first night featured performances by vocalist and composer Maja S.K. Ratkje and progressive hard-rock band Motorpsycho. 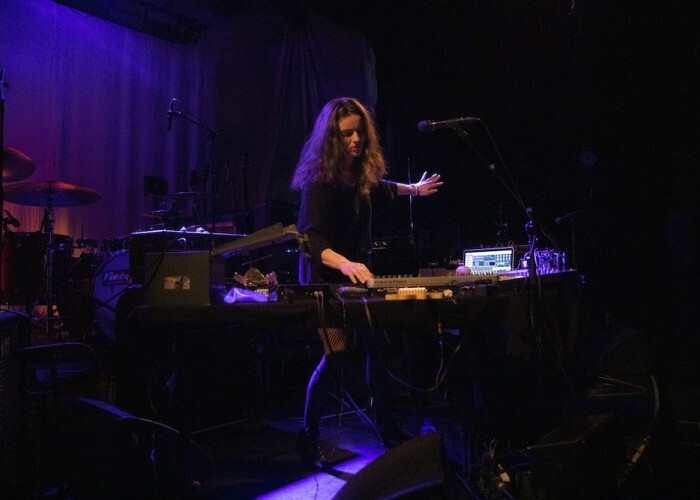 Ratkje took the stage and nestled into a kind of fortress of equipment, surrounding herself with multiple keyboards, a laptop, a theremin and a microphone. As a solo act, she performs improvised vocal music, as well as complex electronic noise; she also composes for ensembles as large as a full orchestra. Her 45-minute set here encompassed electronic zaps and shrieks, wild ululations, delicate waves of sound from the theremin and a surprising passage of sound art, as she crumpled a huge sheet of plastic wrap into the microphone. But Ratkje brought it all back down to earth at the conclusion of her set with a sorrowful rendition of the traditional song “Mining For Gold” (the best-known version of the tune likely being from the Cowboy Junkies’ 1988 album The Trinity Session). Motorpsycho delivered a much more conventional rock set, though the band is highly adventurous in its own way. Its music feels like a cross between the Melvins and Pink Floyd, with stomping riffs giving way to extended improvisations—songs easily can sprawl past the 20-minute mark, especially on their Roadwork series of live albums, which recently has reached its fifth installment. Nov. 30 also was the Norwegian release date for the Hedvig Mollestad Trio’s fifth studio album, Smells Funny. The band headlined the second show, following a packed in-store appearance in downtown Oslo. Their opening act was Fire!, a saxophone-bass-drums trio led by Mats Gustafsson, whose latest disc, The Hands, was issued in January. Bassist Johan Berthling and drummer Andreas Werliin specialize in thick, heavy, repetitive riffs that sound like a cross between krautrock and doom metal. 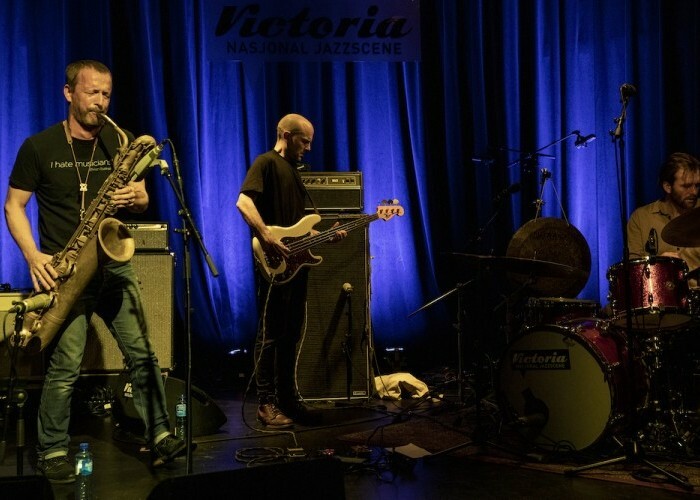 Gustafsson switches between tenor and baritone saxophones on recordings, but at Nasjonal Jazzscene, he stuck resolutely to the big horn, emitting long cries that sounded like a mammoth being speared. He also added waves of electronic noise to the group’s music, bending over a collection of linked pedals and devices on a nearby tabletop, and twiddling knobs and pressing buttons until hideous howls filled the club. Berthling’s bass was a massive roar and Werliin’s drumming was both minimal and ritualistic. Each piece was simultaneously its own thing and part of a larger whole, like stones being assembled into a mound. The Hedvig Mollestad Trio exists in a blurry zone between small-group swing and crunching hard rock. Mollestad’s riffs fly from a massive Gibson, her sound half John McLaughlin, half Tony Iommi. Bassist Ellen Brekken and drummer Ivar Bjornstad aren’t her rhythm section—they’re equal partners, shifting the music on a dime; Brekken, in particular, is a co-leader. Whether on electric or upright bass, her playing is fluid and high-energy, creating countermelodies that frequently become lead lines, as Mollestad retreated to let a single long note sing out, Bjornstad hammering the kit with precise ferocity. Their set was loud and soaring, but when they slowed down and dug into a bluesy ballad, it also could be quite beautiful.